Physiological data provides a plethora of psychophysiological information related with the state of the user. Such data can provide important contextual information upon which computer systems to draw inferences with respect to the affective, cognitive and physical state of a person. In a multimedia system, such information can be useful for control, intelligent adaptation, feedback about the health status, user-tuned content production and many other applications. For example, a videogame can use psychophysiological inferences of the player’s level of mental workload during play to adjust the difficulty in realtime. Multimedia systems only barely incorporate physiological data in their design. In the opposite direction, physiological computing systems can greatly benefit from the more engaging experience provided by the work done in the field of multimedia. 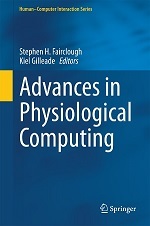 In this special issue we call for the submission of cutting edge research work aimed at bridging the gap between multimedia tools and physiological computing systems, by addressing topical issues involved in the creation of multimedia tools for physiological computing. All contributions will be rigorously peer reviewed to the usual exacting standards of MTAP.